The Iraqi government has said that the executions of two senior associates of former leader Saddam Hussein will take place some time during the week. This is despite an appeal from the new UN Secretary General, Ban Ki-moon, that they should not go ahead. Government spokesman Ali al-Dabbagh said the execution orders for Barzan al-Tikriti and Awad al-Bandar had been signed, and there was no way back. Saddam Hussein's execution has led to a chorus of international criticism. 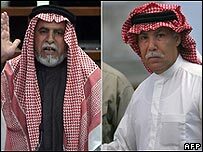 Barzan Ibrahim al-Tikriti, Saddam Hussein's intelligence chief, and Awad al-Bandar, a former chief judge, were convicted along with Saddam Hussein for their part in the killing of 148 Shia Muslims in the Iraqi village of Dujail in the 1980s. Mr Dabbagh said that while the government respected the UN's view, it also had to respect the victims of Saddam Hussein and his henchmen. "Certainly, the execution orders have been signed and are ready to be implemented," he said. "There are some technical preparations that need to take place in order to carry out the court's decision." Saddam Hussein was hanged on 30 December amid chaotic scenes. UK Prime Minister Tony Blair, who had been criticised for saying nothing on the issue, has now joined the critics. His officials now say the prime minister does believe the way Saddam Hussein was taunted and filmed before he was hanged was completely wrong. Earlier, the man expected to succeed Mr Blair as prime minister, Chancellor Gordon Brown, described events at the execution as deplorable and completely unacceptable. 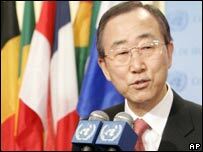 Mr Ban has been criticised for failing to state the UN's policy of opposing the death penalty. He said capital punishment "was for each and every member state to decide" - words that seemed at odds with the UN's policy of opposing the death penalty. But in a letter to the Iraqi representative at the UN, Mr Ban urged restraint in carrying out death sentences imposed by the Iraqi High Tribunal. The UN said Mr Ban's letter "also refers to the secretary general's view that all members of the international community should pay due regard to all aspects of international humanitarian and human rights laws". Iraqi Prime Minister Nouri Maliki has reacted angrily to the international outcry over the execution. He said his government could review relations with any country that criticised the action. Mr Maliki said the hanging was a "domestic affair" for the benefit of Iraq's unity, adding that the former president had received a fair trial. International protest has continued, however. On Saturday Rome's mayor lit up the Colosseum to highlight Italy's support for a global ban on the death penalty. Italy this week began a diplomatic push to have the issue taken up by the UN General Assembly. Former Italian Prime Minister Silvio Berlusconi called the execution a "political and historic error". Several Sunni Arab countries have criticised the hanging as sectarian. Egyptian President Hosni Mubarak said it had turned the former leader into a martyr.